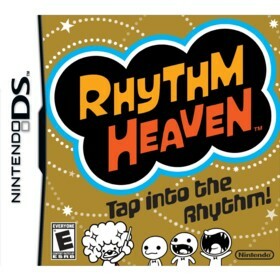 Rhythm Heaven is a Nintendo DS game in the Rhythm genre. The game was published by Nintendo and developed by Nintendo SPD Group No.1. The game has an ESRB Rating of E (Everyone 6+) and was released on 2009-04-05. The game's official site can be found at www.rhythmheaven.com. Rhythm Heaven is a unique take on the whole rhythm genre. Instead of hitting colored buttons in time with a beat, all you do is tap and flick the screen with your stylus. Each of the music minigames is very odd – and its meant to be that way and this variety helps keep the game interesting. For example, in one game you are tasked with refueling robots, in another you control an audience of monkeys cheering for a famous pop singer, while another has you controlling of a member in a glee club. All of the actions take place in time with the beat – so you can actually play the game with your eyes closed and just follow the melodies. Each of the minigames is wonderfully varied and unique which is actually surprising given the simplicity of the controls. After completing five levels you are given access to a remix level where the game switches randomly between each of the previous five levels that you just completed. Also, to increase the replay value, the game rewards you with medals if you complete a minigame perfectly or under certain conditions. These medals can then be spent on goodies within the game. One funny thing I should mention is that initially I was unable to even start the game :). The first thing it asks you is to do is flick a circular icon on the screen, but every time I tried it kept saying I wasn't doing it fast enough (although this might have been because I was playing on a DSI XL with a larger screen). Eventually, however, I got the hang of it, and was able to finally start the game :). Overall, I would definitely recommend checking out this game if are a fan of music games in general and are looking for something a little different than the normal "hit plastic button" formula of most other music games.